Two office properties in West Texas are being marketed for sale. MIDLAND, Texas – (Realty News Report) – Two office properties, considered key trophy towers in the downtown Midland office market, are being marketed by Colliers International. 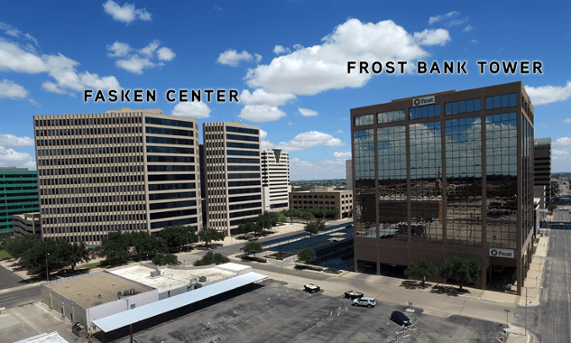 The two properties, Fasken Center and Frost Bank Tower contain a total of 600,000 SF and have high occupancy rates. The West Texas city of Midland is located in the Permian Basin, home of the nation’s largest deposits of shale oil. Colliers International’s Patrick Duffy and David Carter of the firm’s Houston office are marketing the buildings, which sit on 7.8 acres of land. The buildings have maintained good occupancy during down cycles in the energy industry. The Fasken Center is a 421,546 SF twin-tower office complex that is 99.2 percent leased. It was completed in 1974. The 12-story Frost Bank Tower is a 177,952-SF multi-tenant building. The Frost building, completed in 1982 was renovated in 2014. It is across the street from the Midland Petroleum Club. The Permian Basin is home to one of the world’s richest deposits of shale oil. Daily production stands at 2.6 million barrels day and it is predicted that will hit 5 million barrels a day by 2025.